Plagiarism: How do we curb the menace? Plagiarism among school children is a mounting concern. In class, teachers are seeing more and more students handing in material which they have copied from the Internet. Give a class any research work and you can be assured that you will get several identical answers all copied from the same website. It is worrying is that students often cut and paste this information without understanding or absorbing it. What is worse is that most do not realize that they are committing a crime, and a serious one at that. This problem is rampant among our students and starts right in primary school. International universities have already woken up to this problem. In 2010, Penn State University decided to revoke the admission of one student and cancel six interviews because of rampant plagiarism in admission essays. All but one of the students involved were Indians. In 18 cases of mild and moderate plagiarism, 10 of the cases involved Indian students (http://www.pagalguy.com/news/us-b-school-uncovers-rampant-essay-plagiarism-revokes-admission-calls-and-interviews-most-them-indians-a-5891). Were these students’ uninformed victims? Did they lack proper writing skills or did they resort to plagiarizing to get ahead in the rat race? As we ponder on where we went wrong, one thing is clear – we cannot afford to have the educational foundation of our future world citizens based on cheating. Right from kindergarten, pupils learn to copy what the teacher has written on the board. In primary school they start copying answers from their textbooks. They are so used to copying that they continue to do so as they grow older and make no effort to think for themselves. It is therefore the job of the educator to make students mindful of the perils of plagiarism. What is acceptable in little children if continued can have severe repercussions when kids grow older. Why do students resort to plagiarizing? Often primary school students plagiarize unwittingly and if left unchecked it becomes a habit. Generally, our students lack research skills. The Internet has exacerbated this problem. Information is available at the click of a button. The computer has a cut and paste feature which makes it very convenient for students to collect information quickly. 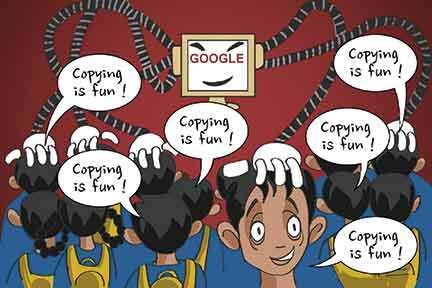 Most students, when it comes to researching and collecting information on their own, are totally unaware that it is wrong to copy another person’s work. They may come up with long scientific explanations with vocabulary that is beyond their capability. Teachers need to put up their antennae when they come across such work. Students also are under constant pressure to perform well. They face not only parental pressure but peer pressure as well. There is a race to outperform one another due to the belief that the better their grades, the better their future prospects. While this may not be wholly incorrect, the fact also remains that unless students develop the right study skills from a very young age, they cannot be in the race for the long run. Faced with this dilemma of excelling or getting left behind, students may be tempted to present work which is not their own. Passing off copied work as their own will only take them so far and they will find themselves road blocked at crucial phases of their education or career. Plagiarism often occurs due to lack of serious research, which in turn can sometimes be blamed on poor study habits. Very often looming deadlines, unmanageable homework, or sheer lack of imagination on the part of the teacher in assigning work can result in students plagiarizing in order to get the work over and done with. Students cannot be allowed to fall prey to the ‘everyone else is doing it’ syndrome in order to justify their actions. As teachers it is our duty to ensure that we nip it in the bud and educate our young ones about what plagiarism is, before it gets out of hand. The most important thing for the teacher to do is to inculcate ethical study behaviour in their pupils from a very young age. All copying is wrong and from the time children are able to string together simple sentences they should be encouraged to give answers in their own words. Too many teachers give in to the convenience of getting students to mark answers in textbooks and then copy them in their notebooks. Explain to the children the concept of plagiarizing. A very good way is to ask them how they would feel if someone copied their work and passed it off as their own. The word plagiarism has its roots in the Latin word, ‘Plagiarius’ which literally means ‘to kidnap’. Teachers must drive home the fact that plagiarizing is equivalent to kidnapping or stealing – taking away something that doesn’t belong to them. In older classes students can be asked to hand in outline notes, rough work, and study notes with their assignments to show evidence of honest research. It is also a good idea to demonstrate to them how simple it is to identify work that has been plagiarized from the Internet. The teacher can pick up a suspect piece of work and easily Google it. This will result in chunks of the plagiarized work showing up on the search engine. During the course of my work I found a lot of primary school students contributing to school magazines in the form of poems and jokes which were obviously not original work. These kids usually want to fit in and be like their peers but find themselves incapable of writing as well as them. They then try to pass off work taken from other sources. Primary schools are not there to punish students for their wrongdoing but to make them aware of these evils and put the students on the right track for life. Hence teachers must reinforce the concept that plagiarizing is wrong and appreciate and reward students’ own work. The school should have a clear anti-plagiarism policy and parents should be alerted about it. At home, the students could do their work in an area which is visible to the parents so that they are mindful of what their child is doing on the internet. Parents can play the role of guiding and supporting the development of good research and study skills at home. Teachers must keep parents in the loop in order for them to supplement the teacher’s efforts at home. 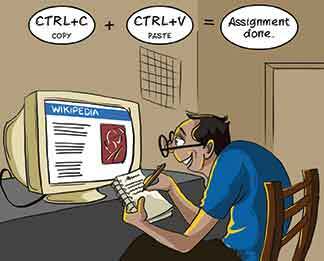 A lot of plagiarizing happens because of the kind of homework assigned. The very idea of giving homework is to enhance a child’s learning by revising what has been done in class or adding to it by way of research. It is up to the teacher to give work which not only encourages the development of curiosity but also needs an input from the students’ own experiences. The students should be conscious that their teacher values originality more than high quality work which is not their own. If the teacher errs in appreciating something that is obviously beyond the capacity of the child versus something simpler which has been produced by the child, then a wrong precedent is being set. This creates a backdrop for more copying in the future. An interesting idea that I came across while researching for this article was to assign a piece of work to students. Upon submission, shuffle the assignments and have students read each other’s assignment aloud in class and get credit for work that is not their own. This will effectively drive home the point of how frustrating it is to have someone else take credit for their work. Students must be taught how to give credit where it is due. The Internet is a treasure trove of information and many expert opinions, scientific studies, and prior publications can be quoted in a student’s assignment. However, they should be taught that the teacher wants to know their point of view so that they do not forget to express their opinion. That is where real researching, learning, and understanding comes about. Works of other authors should always be presented within quotation marks and sources like books or websites acknowledged. This does not take away from their work but adds weight to their research abilities. Once the teacher has made an effort to set a classroom policy regarding plagiarism clearly then action must be taken against those indulging in it. Teachers cannot afford to reward work that is obviously not the pupils’ own with good grades, nor can they afford to ignore it. Both teachers and students must be mindful at an early age of the perils of unconscious plagiarism. This brings to mind the case of Kaavya Vishwanathan who made waves in 2006 when she signed a book deal for a staggering amount of money. Later the book deal was cancelled amidst claims of plagiarism. Kaavya’s plea that she did not copy but probably imbibed it unintentionally and unconsciously did not hold water and she lost the contract. Apart from monetary loss she had to face the embarrassment of becoming famous for all the wrong reasons. Cheating will not take our students very far in their academic lives. Teachers must encourage students to produce good work on their own. They can only do so by making students aware of plagiarizing, teaching them how to credit sources of information, inculcating good research and writing skills in them, and appreciating every effort that the children make. Once upon a time, plagiarism was a problem faced in schools of higher education. However, with the widespread availability of the Internet it is rapidly spreading among very young children as well. We all need to take combined action against plagiarism or we will end up with a generation of pupils who don’t know otherwise. They are unknowingly harming their prospects and we as teachers will have to shoulder the burden of this mistake if we do not take immediate action. Academics everywhere face an uphill task in their war against plagiarized work. Resorting to web services is one way to weed out this problem. However, the best thing to do is to ‘prevent rather than detect’ by ingraining in students that plagiarizing is wrong. The teacher who does not impart the skill of researching and having pride in one’s own work among the students does a great disservice. If primary school teachers make this awareness a part of their students’ psyche, students will be set up for life. Also read the cover story, ‘Cut, copy, paste’ carried in the July 2007 issue of Teacher Plus. The author has been a teacher and school administrator in India and Singapore for nearly 20 years. She is now a freelance writer. She can be reached at vandanaaggarwal@hotmail.com.